A few niggles aside, Tera Synth is admirably easy to use, super flexible, sonically superlative and highly recommended. Effects processors sound great. Good level of control and useful interface. Compatible with other iOS apps. 900 presets. 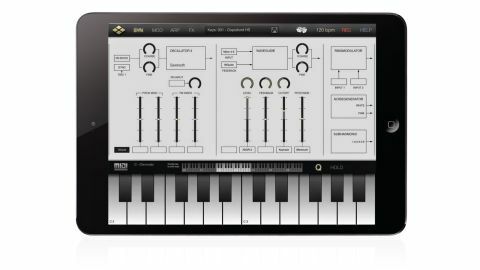 VirSyn's latest mobile marvel is a semimodular synth for iPad (ie, one in which a fixed array of modules are freely connected to each other) with specs just as high as those of many 'full size' desktop plugins (in case you're wondering, it's a "subset" of VirSyn's Tera 3 PC/Mac synth). Tera Synth's 25 modules include three virtual analogue oscillators (complete with PM and FM), a physical modelling oscillator, two analogue modelling filters, a formant filter, four ADSR envelopes, four LFOs and four multistage envelopes. "Helpfully, when any of the 12 main mod sources is selected, its interface pops up in an overlay"
You navigate them by scrolling left and right in two pages - SYN and MOD - and you patch things together tapping the many input assignment boxes throughout the interface and selecting your audio or modulation source from a popup menu. Helpfully, when any of the 12 main mod sources is selected, its interface pops up in an overlay (replicating its equivalent in the MOD page) for immediate tweaking. The ARP page hosts a powerful 32-step arpeggiator, featuring separate randomise functions for all of its parameter lanes (Note, Tie, Accent, Octave and Key), as well as a Swing control. The FX page is home to five effects processors: Distortion, Phaser, Delay, Chorus and Reverb, all of which sound great and offer a decent level of control. You also get over 900 presets, VirSyn's patch randomiser (scrambling everything but ARP and FX sections), and the full range of iOS compatibility protocols (Audiobus, Inter-App Audio, etc). Our only significant complaints relate to the modulation setup. While the list of things that can be modulated is extensive (every stage of every ADSR envelope, for example), it's slightly disappointing that each parameter can only accept a fixed number of inputs - in many cases, just one. Patches can, of course, get pretty complicated, too, so some sort of routing overview would be a good addition, even if just in the shape of a regular modulation matrix.